I would like to tell Horse Riding Clubs Association of Victoria (HRCAV) members all about the problems with my horses and how the Gotcha Feed Plan has helped. I have a Riding Pony Thoroughbred cross and my daughter has a Percheron Clydie cross. They both are very good doers and over the years I have had to learn very quickly on how to prevent a laminitic episode, etc. About three years ago in the middle of winter my Galloway could not walk or move so I called the vet and he told me he had foundered. I could not believe a horse could founder in the middle of winter. I called a barefoot trimmer as he had to be trimmed to prevent further rotation of his pedal bone. Jo Stuart put me onto the Safergrass website which has an abundance of information about fructans, sugars, carbohydrates, how frosts affect grass, etc and is all very technical but fantastic information. I found vets could really not provide enough assistance putting my horse on Bute, x-raying hooves and giving me large bills. Over the years I have had to fiddle with their feeds, soak hay, buy in different hay lots to see what suited, and have also turned my ménage into a dry lot paddock for him to live in. We have also managed the grass growth by cutting hay, slashing and also making up smaller paddocks and yards. I have also asked different feed nutritionists for advice with not a lot of help apart from copying off the Safergrass website. With our Clydie mare I have had problems with her glands swelling up which would only happen at various times of the year. She was on a very short grassed paddock and I have had different vets out to tell me that it is probably just an allergic reaction to something! She has been very difficult to trim down and just stays fat on air I think. She has also had problems with stiffness and was on several joint supplements and herbs. With my Galloway I have spent quite a bit of money on various saddles, saddle fittings, chiropractors, massage, bowen therapy, supplements, herbs for mobility and blood tests. He tended to drag his feet as he was walking around his yard, his hindquarters were always a bit tight and his canter transitions were never great. Recently I thought I would sell him onto someone and get myself something flasher to compete with! After reading Alison's story in last month's HRCAV Chaff Chat, I hopped on the Gotcha Equine website where alarm bells were ringing in my head, especially as this was more relevant to Australia. There was more information on different types of grass and how it can affect our horses. After reading this information it became clear that I needed to try these products to see if it helped. I rang Lucy Prior of Gotcha Equine and she helped me with product selection and answered all of my questions. I was already very aware of soaking hay and careful with my grass grazing at particular times of the day and circumstances. But my current supplements and herbs were causing the problems with my horses and not supplying them with what their bodies and muscles really needed. I started both horses on the supplements and really needed a good result from them as I was competing at the HRCAV Top Team Trophy (TTT) Combined Training at Werribee on my Galloway. Well I must say my horse behaved perfectly, didn't spook, showed more throughness with his hindquarters and his canter transitions were good but still need more forward. It was a lovely test with good comments from the judge who said he was a lovely, obedient boy with good rhythmical paces. We did an outstanding clear round in the showjumping with no spooking and no time penalties (pictured left, photograph Derek O'Leary). We ended up in fifth place which I was absolutely wrapped with. I have found no stiffness issues or soreness as we usually do after a competition. We have also solved the problems with our mare and her glands have not gone up again since making the changes. Just when you think you know it all about horse feed and supplements you can always find out more information. We need to learn from our horses what they really need and not be afraid of making changes. So I am keeping my Galloway and will continue with my goals and keep him as healthy and happy as I can. The list above does not include all the different types of vitamin, mineral and electrolyte supplements or feed costs that I have tried over the years. 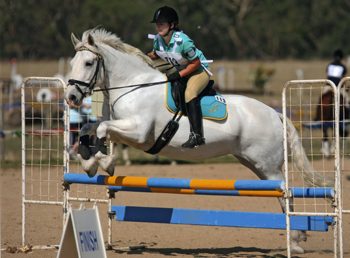 Thanks to Lucy for your advice and great information on the Gotcha Equine website. Sue Hocking - Romsey, Victoria. 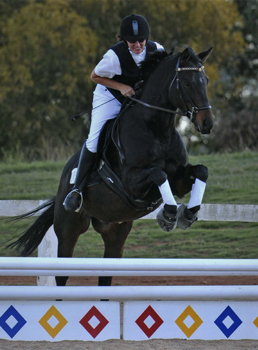 Riddells Creek Adult Riding Club (ARC) member. Story Update: May, 2010. I thought I would send another shot of our mare Star who was again another star on the weekend. 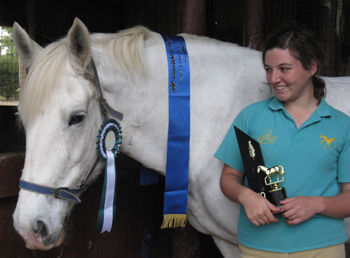 They achieved best dressage and first place in Level 3 Combined Training which Amelia was pretty thrilled about. There were lots of other horses going silly at the event again!